The following comments about attractions in Irving have been posted from individuals. We believe that the best reviews of Irving, Texas (TX), TX USA are written by travelers and holiday makers who have experienced Irving first hand and want to share their thoughts. Can you share yours? 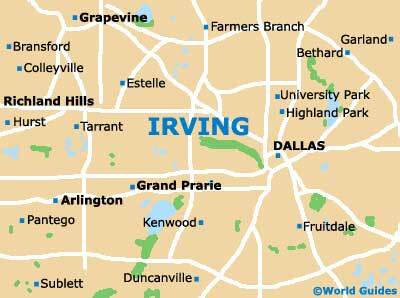 Please help us expand this section of our Irving World Guide. Let us know what you think about the attractions in Irving, Texas (TX) USA. Submit comments about Irving attractions here. The Mustangs of Las Colinas are really impressive sculptures and I took dozens of photos of them, from all kinds of angles. They are very dramatic and enhanced by the fountains and water. The fountains at the horses feet really make it look like they are frozen in mid-gallop - very evocative. In total there are nine bronze horses gallopping through the water, which is supposed to represent a river. This is actually the world's biggest horse sculpture ever made. The Mandalay Canal was great! We all through that the Mandalay Canal was great and it gave the Las Colinas area a lot of character. We enjoyed walking along the canal banks and exploring the shops. It was very pretty. The canal is lined by big trees and there were ducks following us in the water. Lots of seats if you want to stop off and daydream. Please note that these Irving, Texas (TX), TX USA comments and reviews are posted by individuals and are not necessarily the views of World Guides.